You’ve got to hand it to those hardy survivors that manage to thrive in sidewalk cracks, along roadsides, and in wind-blown meadows. They’ve managed to adapt to conditions that our garden plants wouldn’t even consider! And there’s so much they can teach us. Consider enticing your school gardeners to establish a wildflower planting, which could range from a small patch outside school to an entire meadow or prairie restoration project. They might just create a vibrant, visual oasis, and a laboratory for learning, to boot. Keen observers can witness firsthand the adaptations — for seed germination, pollination, and so on — that enable wild plants to survive in their environments. They can discover the insects, birds, and a host of other wildlife that depend on these natural communities for food and cover. And they can examine the complex web of relationships that sustain life. Questions that inspire investigations, research, and reflection will naturally emerge: How does life in our school garden compare with life in the wild? Which types of pollinators are drawn to which flowers? What allures them? How do wild plants protect the soil? Why is one person’s wildflower another person’s weed? Read on for how-to advice, curriculum ideas, and resource links. 1. Assess your site. 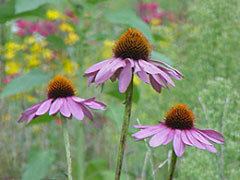 Have your student gardeners take an inventory of their proposed wildflower area. What plants are already there? Are there any native plants or wildflowers we’d like to leave? The class might also visit nearby lots, roadsides, and meadows and try to identify wild plants that occur locally. Observe the amount of sunlight that drenches your site at different times of day. An open area with a minimum of six hours of sun daily is ideal for most flowering wild plants. What is the character of the soil? (Well-drained? Dark and rich? Compact?) A well-drained soil is ideal. Since many wild plants are adapted to poor soils, you shouldn’t need to enrich yours unless it’s very dense (in which case you can add organic matter). Consider contacting a local Cooperative Extension office, soil conservation service, nursery, or garden center for help assessing your site. 2. Select seeds/plants. A wildflower planting usually features annuals (plants that flower and complete their life cycles in one year, often reseeding themselves), biennials (plants that bloom during the second and final year of their life cycle), and perennials (plants that bloom for several years). Although the latter types take longer to establish, they are also longer lasting. Natural wildflower meadows (and many mixes) typically include some native grasses, which support and protect tall flowers, fill in spaces that weeds might otherwise fill, and prevent erosion. You can purchase a ready-made wildflower mix (a meadow in a can!) designed for general regions, but these mixes may contain seed of plants not well suited to your area. To enrich students’ learning, consider having them create their own seed and/or plant mix by first discovering which plants would grow best in your area. They might contact one of the organizations mentioned above, or visit the websites listed on the Resources page. Many seed companies will also advise you on selecting appropriate plants. If you decide to plant a variety of single species that are native or at least suited to your region, have students identify and consider heights, colors, and bloom periods, and whether each plant is a perennial, self-seeding annual, or biennial. This should help them plan a plot that blooms through the season. They can also use it to create a map, to scale, of their vision. Keep the soil moist while seeds are germinating and seedlings are young. There are a number of ways to attack existing or slumbering weeds. You can start by using garden forks to lift out as many underground rhizomes and other weed parts as possible. By rototilling the soil lightly, you can create a nice bed without bringing too many weeds to the surface. If you then water the soil a week or two before you plant, you’ll be able to remove the weeds that do sprout. To prepare for planting, lightly rake and firm the soil. If you have a chance to prepare the site well in advance of sowing seeds, consider the following approaches. If you are planting where vegetation (e.g., grass and weeds) already exist, cover the area with cardboard and a thick leaf or straw layer, keeping it on until you’re about ready to plant. If you have sunny summers, consider mowing, tilling, and watering the soil, and then covering it with sheets of 2- or 4-mil clear or black plastic and sealing the edges. The intense heat can kill weeds and seeds in 2 to 6 weeks. 4. Plant. If your wildflower mix has abundant annual flowers, or if it makes sense given your school calendar, sow your wildflower seeds in the spring. This would also be the time to transplant any wildflowers you’ve started in the classroom or purchased. If your wildflower mix has a lot of native grasses and perennial flowers, consider planting in the late summer or early fall. Seeds of perennials, which often need a chilling period, will sprout when spring warmth and rains come. Fall planting also eliminates many of the sprouting weeds that can plague spring plantings. Students can broadcast seeds by hand, although a spreader is handy for seeding large areas. To ensure that young hands spread the seeds relatively evenly, mix one part wildflower seeds with four parts of dry sand or vermiculite. Water seeds thoroughly if rain is not iminent. After seeding, rake the top inch of soil lightly so seeds are not buried too deeply. 5. Maintain your wild oasis. In the early stages, it’s particularly important to keep the soil moist and weed out undesirable intruders, which will rob your plants of nutrients and water. Unfortunately, it can be tough to tell unwanted from chosen plants. (Some school growers put in actual plants, rather than sowing seeds, for this reason.) Your keen observers, in time, should become familiar with the young wildflowers they’ve sown. The Resources page features websites and books that can help students identify plants. If you have enough annuals, your patch or meadow should be vibrant the first year. Encourage your students not to be discouraged, however, if growth is slow. Many perennial wildflowers spend the first season growing roots and have very little top growth, and then bloom in the second year or beyond. You can always add extra annual and perennial plants to fill in gaps. Since your wildflower patch will evolve over time, students may want to document the process with illustrations or by taking photos or videos at regular intervals. In the fall, ideally after a first frost, mow or otherwise cut back plant tops and leave their debris on the ground. The seeds they release may germinate come spring warmth and rains. Sow seeds 1/4″ to 1/2″ deep. Chill them in a refrigerator in moist peat moss for 3 to 4 weeks. Sow seeds 1/8″ to 1/4″ deep. Sow seeds on surface. (They need light.) Chill in a refrigerator in moist peat moss for 3 to 4 weeks. Sow seeds 1/4″ deep. Put dry seeds in a plastic bag in the refrigerator for 4 weeks before sowing.